Brighten the flooring of your home with this large rectangular rug featuring a playful contemporary style. 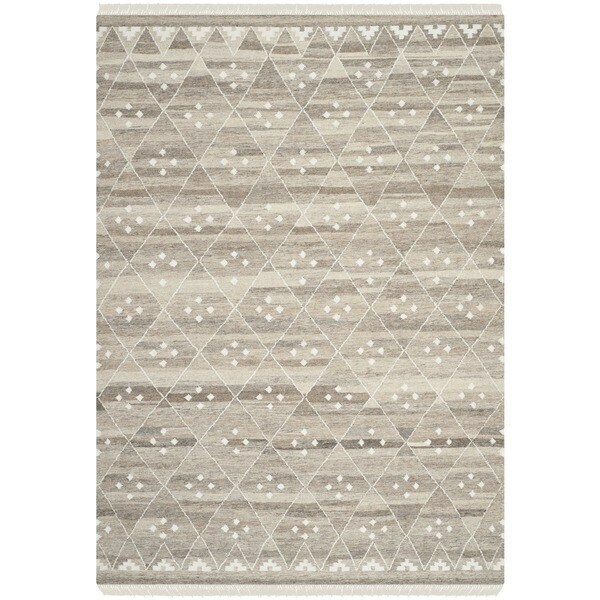 Let your eyes dance across the ivory colored geometric accents on this natural wool toned hand-woven rug. Crafted by skilled artisans, this soft wool piece is truly unique and features the practicality of naturally insulating material for you home. I purchased this rug for my sunroom. I read a lot of reviews and some said the rug was gray toned. I was concerned it was going to be too gray based on the reviews, but bought it anyway. The rug arrived extremely fast! When I laid it out, I was a little dissappointed because it looked more tan to me than gray. The lighter colors in the rug are definitely more yellowy tan and the darker colors maybe just a hint of gray brown. Even though it wasn't exactly as I had hoped, the rug fits nicely in the room and pattern is perfect to add some interest without stealing the show. Was a bit thinner than I would have expected - so please be sure to get a good/thick rug pad to use underneath. Also a tiny bit scratchier that I would have hoped. The color is a bit more tan/natural - than gray-ish/natural - but that could be my computer monitor? Still - giving 4 stars as I expect with both a baby and a dog, this rug will last! I've had this rug for a little over 2 years now and it's held up pretty well. It Kilim so it's thin and rough textured but it looks and feels exactly like more expensive kilim rugs out there. The gray has a lot of variation to it so it would go with a wide variety of grays - from natural/slightly warm to cool grays. The white is a pretty true white. It does need a nonstick pad underneath as it is very slippery on a wood floor. This rug is beautiful and very nice quality. This rug has many striated colors of beige and grey/lt brown. The pattern isn't overpowering. I don't think it is as nicely made as some of my dhurries of the past so I won't be able to use both sides.I still like the rug and I'm glad I got it. I first saw it on Houzz in a room that was redone for Ashton Kutchers mom. Beautiful rug, looks like Magnolia Home at a fraction of the cost. Lays flat right away, perfect flat weave for under a dining table. Colors and pattern was balanced, and the fringe looks as if it will withstand foot traffic without a problem. Love it! Exactly as pictured and came quickly. "Wondering if this particular rug is soft enough to lounge on (with a rug pad underneath). I have a regular wool rug which is comfortable for my kids to lie on and watch TV, etc., but I want to make sure this rug isn't super rough/scratchy. Thanks!" This rug is made out of wool and should be comfortable enough to lounge on. This rug is pretty thin however. These thin wool rugs are a little scratchy. They look cool, but we don't lay around on them. We use floor pillows for that. This rug is EXTREMELY rough and scratchy. Do not buy it for lounging purposes. Hello winzmcbeav, we appreciate your inquiry. No, this item is not reversible. We hope you have found this information helpful. Thank you for shopping with us. Have great day!